Outside the city of Omsk in western Siberia, a new road branches off the Trans-Siberian Highway. You can follow this lengthy detour all the way to Moscow, stopping to visit some of Russia’s most beautiful cities. West of Omsk, everything started changing. Near Omsk, I came to an intersection with the E-30 highway. It was the first major road besides the Trans-Siberian Highway that I had seen in 6,500 kilometers. I turned onto the E-30 and left the Trans-Siberian behind. The E-30 proceeds over endless steppe, the flatland of Central Asia. Isolated farming communities appear about every 60 kilometers. Outside the window, I saw men chopping firewood and working in gardens. Little boys sat by the road selling potatoes. Fyodor Dostoevsky described these rural scenes as places where “time itself seemed to stand still.” Now I understood what he meant. The E-30 highway dipped south again to reunite with the Trans-Siberian Highway, and we turned onto the E-22 highway to Tyumen (nine hours, 630 kilometers from Omsk). One of the oldest cities in Siberia, Tyumen is a pleasant spot to spend a few days and provided my first real glimpse into Russia’s past. Most Siberian cities are fairly new, but Tyumen is almost ancient by comparison. Founded in 1586, the city features many impressive churches, with many that are more than two centuries old. The E-22 leads to the city of Yekaterinburg (4.5 hours, 330 kilometers from Tyumen). We passed a sign showing the distance to Moscow for the first time on my trip, an indication that we had almost left Asia. Hills replaced the steppe as we neared Yekaterinburg. I passed small villages neatly anchored in typical European fashion by a church. In Siberia, I rarely saw churches but as we edged towards Europe, they were everywhere. 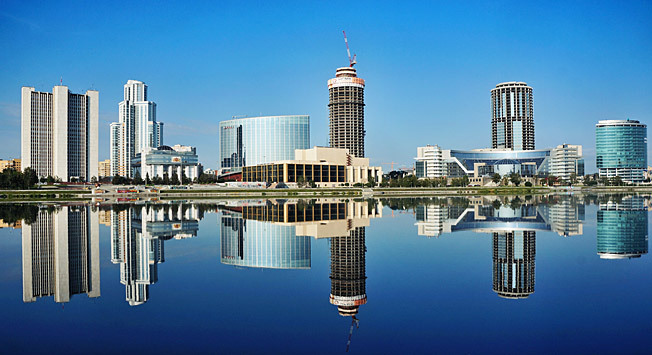 Yekaterinburg doesn’t look like other Siberian cities. Office buildings and historic churches alike stand near the waterfront along the Islet river. A dam constructed during the city’s founding in 1723 still contains some of its original sections that remain in the form of petrified wood. I drove outside Yekaterinburg to Ganina Yama where the remains of the family of Nicholas II, Russia’s last tsar, were discovered and a monastery now stands. Below gorgeous wooden churches, I strolled next to people bowing their heads before a large cross. I stopped by a photo exhibition of the tsar’s life. One picture showed him with a mustache long and bushy like two squirrel’s tails, sitting on a fence and rolling his eyes like a court jester. Outside Yekaterinburg, the E-22 winds up forested hills into the Ural Mountains. I pulled over by a monument that marks the boundary between Asia and Europe. At last, I had officially crossed Asia, the world’s largest continent. The architecture of European Russia enchanted me. From the Urals, we continued to Perm (five hours, 320 kilometers from Yekaterinburg) where many buildings from the classic novel “Dr. Zhivago” can be found. While wandering Perm, I stopped by an old wooden house with a tin roof that stood before a plush high rise. I found this curious juxtaposition of the old and new in most Russian cities. West of Perm, we followed the E-22 to Kazan (9.5 hours, 675 kilometers from Perm) in the Republic of Tatarstan. The houses on the way to Kazan are painted bright oranges and yellows, resembling gingerbread houses from a children’s fairy tale. Behind the white walls of the Kazan Kremlin, towering mosques rise up beside Christian churches—a testament to the city’s diverse cultural influences. I wandered through the kremlin as a full moon rose into the night sky, illuminating the shimmering waters of the nearby Volga River. I turned onto the M-7 Federal Highway outside Kazan and headed towards Moscow. Many Russian cities are built on hills that once served as a means of protecting residents from the roaming Mongol hordes. The city of Nizhny Novgorod (six hours, 400 kilometers from Kazan) is no different, an ancient urban center poised on a knoll above the Volga River. Nizhny Novgorod was one of the most memorable destinations that I had visited yet, a city of lavish cathedrals and a mighty kremlin surrounded by brick walls. The cities of European Russian marked my entrance into a very different part of Russia than the steppe of Central Asia. But my journey had not ended yet. In the outskirts of Moscow, the M-7 met up with the Trans-Siberian Highway again, and I continued driving.